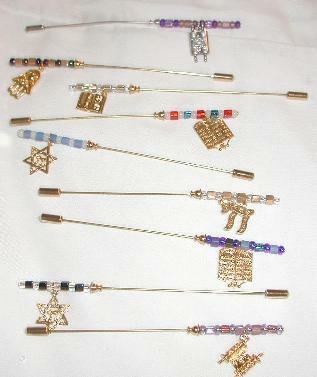 Chadis Crafts - Jewish Hat and Stick Pins. 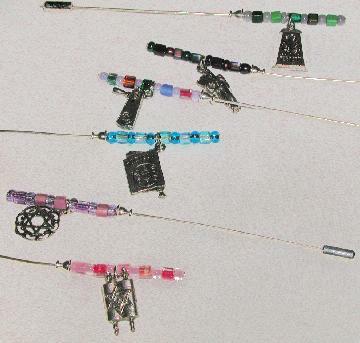 All 4" styles are $10.00 each plus shipping. 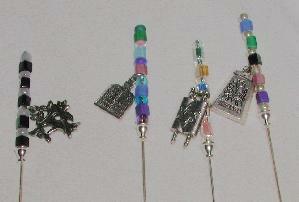 Jewish Wedding/Chupah Charm in your choice of Golden Pewter or Pewter. You tell me which months of the birth of your children, grandchildren, you and your spouse. 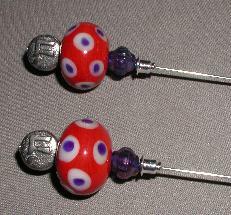 Square Glass Beads for birthstones and clear round bead between them. We will design a pin together. 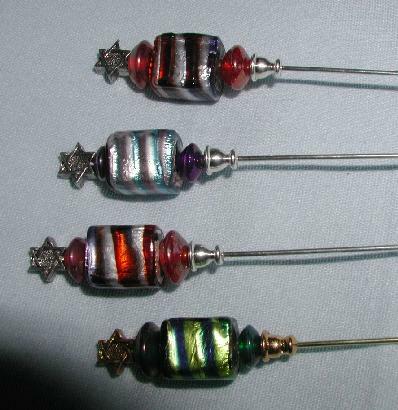 The one pictured had 6 square beads. Remember if more than that less of the stick pin will show. 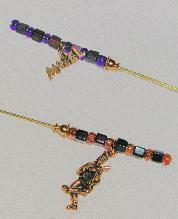 One charm of your choice plus many more beads. 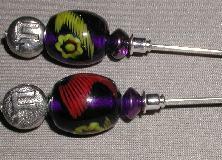 Special $15.00 each plus shipping. 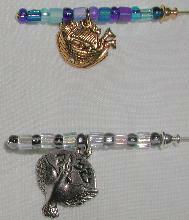 Your choice of one charm and beads. Pewter and Golden Pewter Charms. 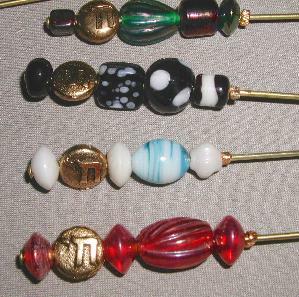 Have ends to be used as a stick pin or with out end for hat pin. 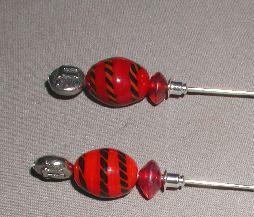 Round and Square Glass Beads. 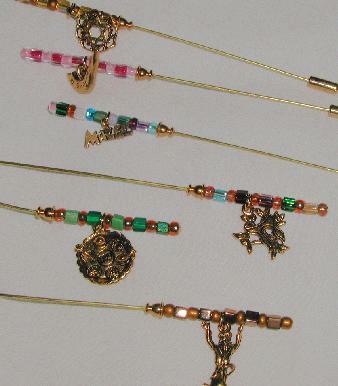 Assorted Charms of Gold Plate, Pewter and Golden Pewter. 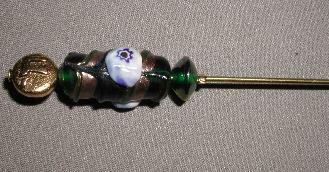 Stopper added to keep beads from falling off. 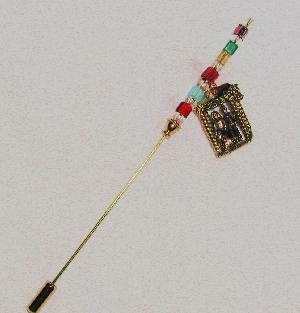 #5JGPMINISTAR Gold multi color tube 6"
Now has a clear plastic stopper to hold beads up top of hat pin. 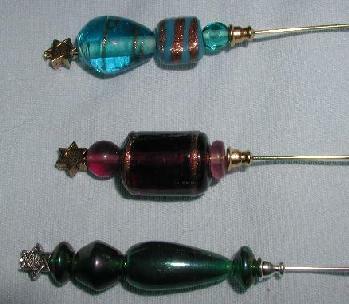 All come with a clutch end that protects the end or can make a Hat Pin into a stick pin.